Look Who?s Walking ? a parody special dedicated entirely to The Walking Dead! Those rumbly-tummy corpses from AMC's The Walking Dead get re-animated in a totally different way thanks to Adult Swim's late-night sketchfest Robot Chicken! See the never-before-revealed SECRET HISTORY of the greatest TWD moments the way Robert Kirkman always intended: acted out by spongy-looking puppets! It's a brand-new half-hour parodying TV's top hit, starring not just the Robot Chicken regulars but as many players from the Walking Deadcast as we could cajole/bribe/threaten to take part! And rather than leave the DVD half-empty, we filled it up with extras galore! And like always, you'll be amazed at how little money we spent on those extras! What are you waiting for? The dead could rise tomorrow! 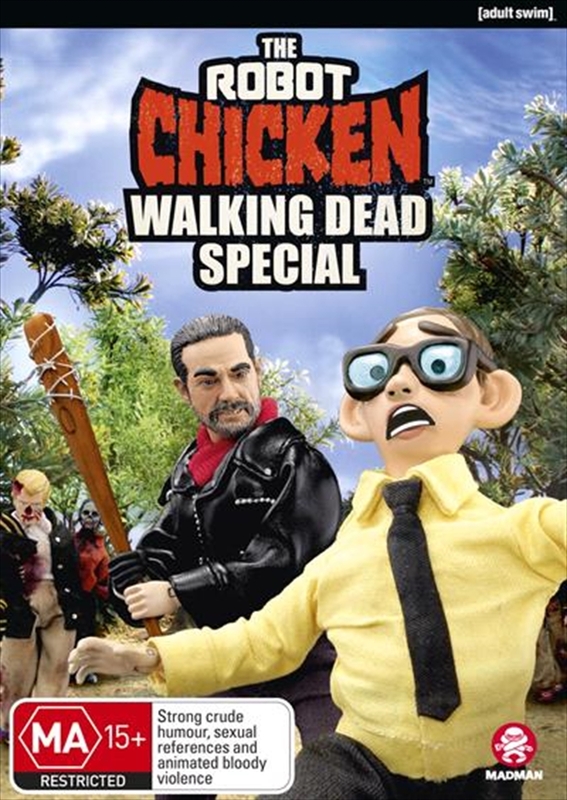 Don't get devoured before you watch The Robot Chicken Walking Dead Special: Look Who's Walking!